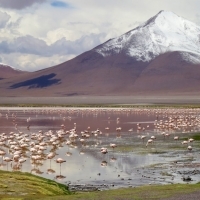 In the southwest of Bolivia, high in the Andes, there is a beautiful nature park. You will find hot springs, lakes that change colour, ancient plants and animals that only live there. It is far away from civilization and only accessible through a network of gravel roads and dirt tracks. The route through the area known as the “Lagunas Route”. 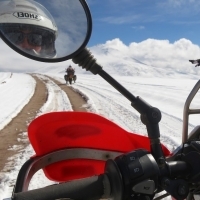 A multi-day trip through rugged terrain, which can be very challenging due to the altitude and the changeable weather. 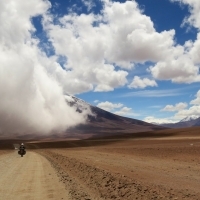 We heard about altitude sickness, crashes in the deep sand and gusts of wind of hurricane force. But we also heard that for many travellers the route was a highlight of their trip. And that was the deciding factor: we are going to ride Lagunas Route! That does not mean that we do not listen to the impressive stories of travellers who went there before us. The route is notorious. It is an adventurous journey that we should not start without any preparation. At the same time, from experience we know that stories can sometimes become more exciting as the evening progresses: with every beer the sand gets deeper and the wind blows stronger. It’s good to know what to expect, but we really have to take a look ourselves. After a short visit in Calama, where we said goodbye to Peters parents, we’re back in San Pedro de Atacama in Chile. 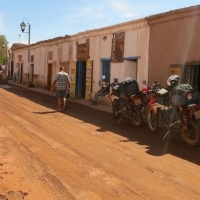 The touristy desert village is the starting point of the Lagunas Route for us. 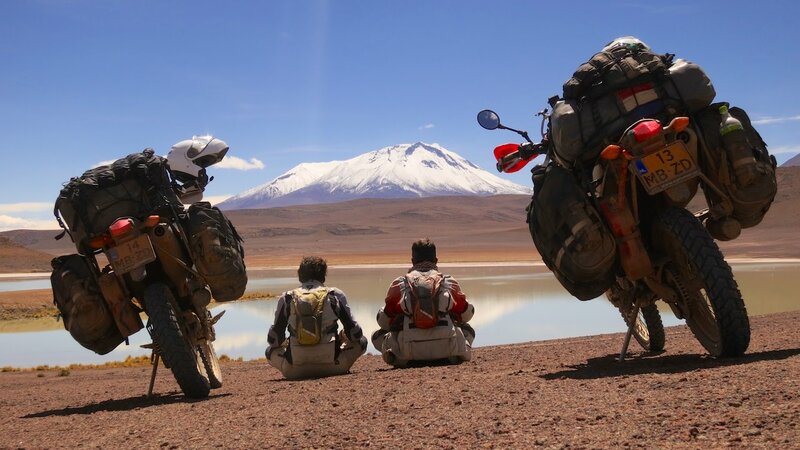 From here we will follow the Lagunas Route to ride to Uyuni, which is 500 km from San Pedro de Atacama. A distance we will cover in four days. The roads in the area are not signposted, so we will have to rely on the GPS and the tracks in the sand. Based on information from other travellers, we put different routes in the GPS and make waypoints for places to sleep. Along the way, we will not be able to buy fuel, so we have to bring enough for the whole route. 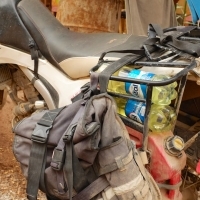 We fill the jerrycans and tie two water bottles filled with fuel on each motorbike. A total of 25 liters, which should be enough. We can take 18 liters of water, which we use for drinking, cooking and brushing our teeth. That is not enough for four days, but if the information is correct we can buy some more on the route. 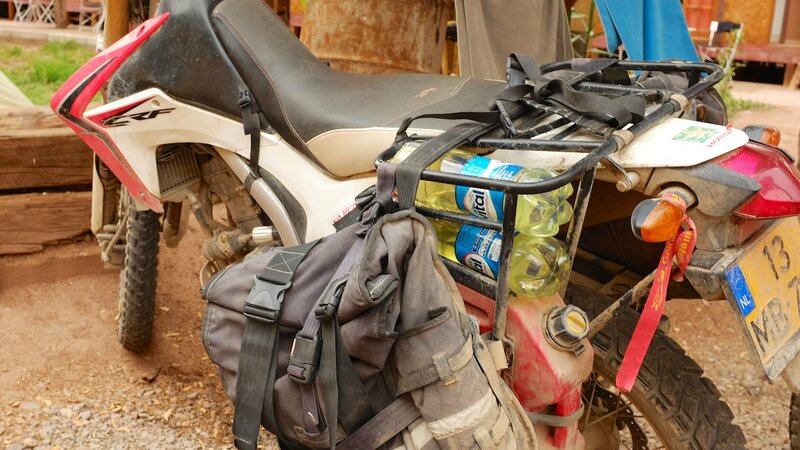 The motorbikes are now quite heavy because of the extra fuel and water. That will not make riding in the sand any easier. To prevent putting even more weight on the bikes, we cut down on the food we take. We only take nutritious food that does not weigh too much and is quick to prepare: oatmeal, tacos, boiled eggs, peanuts, noodle soup, pasta and packets of soup that can serve as a pasta sauce. It will be no culinary delights, but it is certainly enough to feed us for a few days. Finally, Peter also gives the bikes some much needed attention. 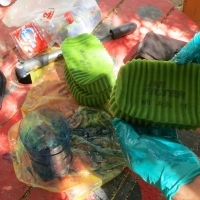 He replaces the oil, cleans the air filters and does some maintenance on his shock. Then we just have to hope that the weather gods will be favourable. Although the rainy season in Bolivia is officially over, it has been raining quite a bit the last few days. 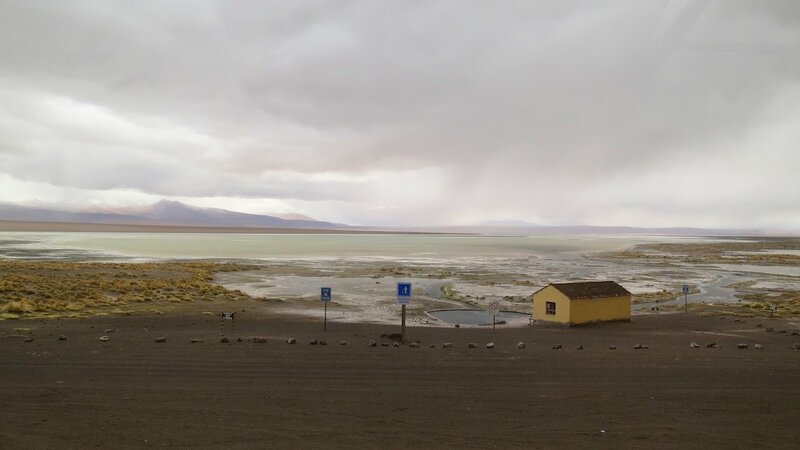 Even in San Pedro de Atacama, the driest place on earth, we were surprised by hefty showers and thunderstorms every night. 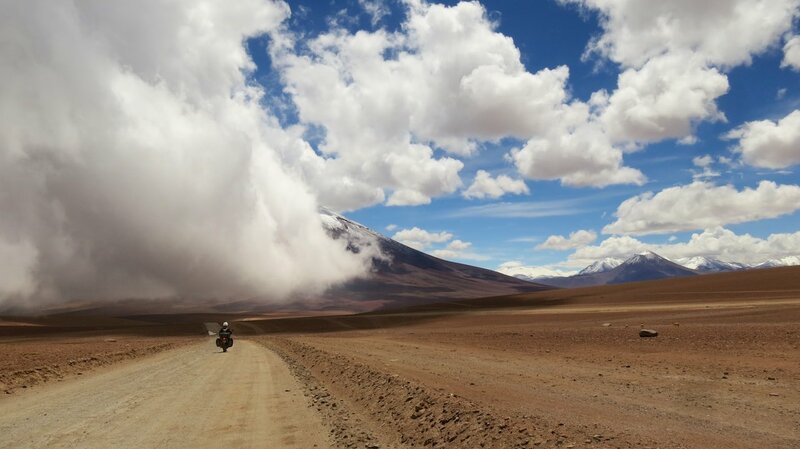 It makes no sense to wait for better weather, because in the high Andes the weather is unpredictable anyway. We cannot take it into account. And the same goes for altitude sickness. 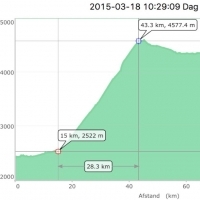 Almost the entire route we will ride above 4,000 meters, with the highest point at almost 5,000 meters. There is not cure for altitude sickness. The tour guides swear by chewing coca leaves, of which they all have a lump in their cheek. The local pharmacy tries to sell us pure oxygen. We stick to coca tea and paracetamol and hope that spending some time on high altitude the last few weeks will be enough not to get sick. Along the way, we will need to drink lots of water and stop in time to rest. It will not be a lack of preparation that will stop us. And even if something happens along the way, we’re sure we’ll find a solution. 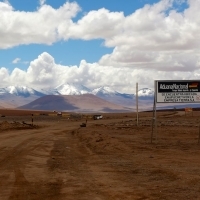 The area is remote, but it is also one of the most popular destinations in Bolivia. Almost daily a group of 4x4s with tourists rides through the area. If we need help, it will take no more than a day before we meet them. In short: we are ready to go! All we have to do is get on the bikes and start riding! At the end of the morning we first visit the Chilean customs office in San Pedro de Atacama. 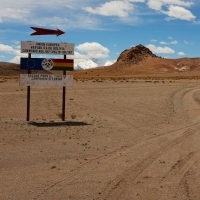 We’ll cross the border to Bolivia today. The border is still 50 km away, but we will need to settle the Chilean paperwork here. It doesn’t take much time. With the stamps on all our paperwork, we are back on the bikes within fifteen minutes. Once we leave the town, we are right back in the desert again. The road stretches like one straight line in front of us. First in through the desert, but then up against the flanks of the volcano. 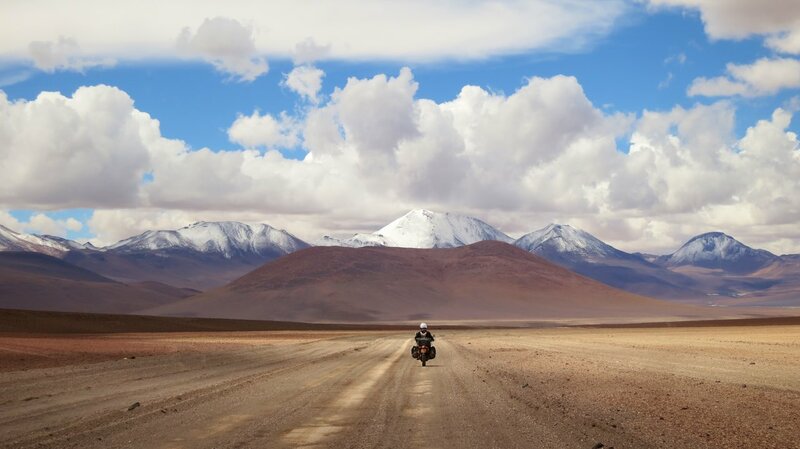 It is the same road we rode with Ton and Marijke a few weeks ago, when we arrived in Chile from Argentina. From the top of the hill we then had a magnificent view over the desert and San Pedro de Atacama. Going up the hill, the view is just as impressive. You can almost see where the lava once came down from the mountain. The ride is special, because we ride up the volcano in a straight line, almost without curves. 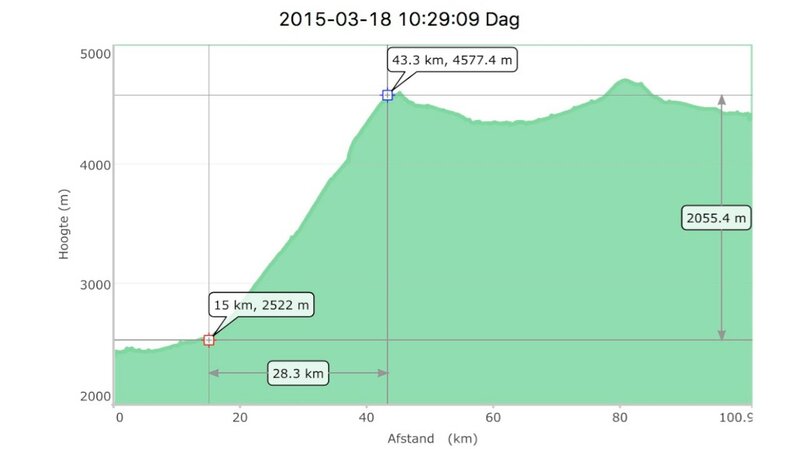 Over a very short distance we climb from 2.500 meters to over 4.500 meters! It is so fast that we both have to get used to the altitude. I have bubbles in my stomach, my head feels strange and I am short of breath. Halfway up the slope we stop, to literally catch our breath and drink. It’s chilly. Just a few minutes ago we were in the sun, but the sun will not come back. In the distance there is a thick layer of clouds hanging between the snowy peaks. At the top of the hill, we are at the level where we just saw the clouds. From the valley a huge load come floating towards us and moments later everything is gray. We are riding just underneath the cloud, it’s like someone just closed the cover over our heads. We turn left onto a gravel road and say goodbye to the asphalt. The next 400 km we will ride on gravel roads and dirt tracks. To have some more grip on the soft surfaces we let some air out of the tires, and continue in the direction of the border. After a few kilometers we have to stop at a barrier that is lowered across the road. 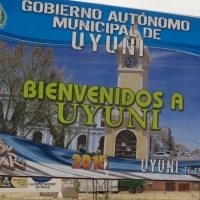 Beside the road are two small buildings and a big sign that says “Aduana Nacional”. A soldier with a Bolivian flag on his uniform comes out to meet us. With his hand on his gun, he walks around the bikes and then he shows us where to go. Inside two men are sitting behind a small table. As we fill out our data on a form, the men look at the extensive collection of stamps in our passports. After a murmur of approval they turn to us. One of them puts a beautiful stamp in both our passports: “30 dias”. As a tourist, we can enter the country for 30 days. That is not very long. 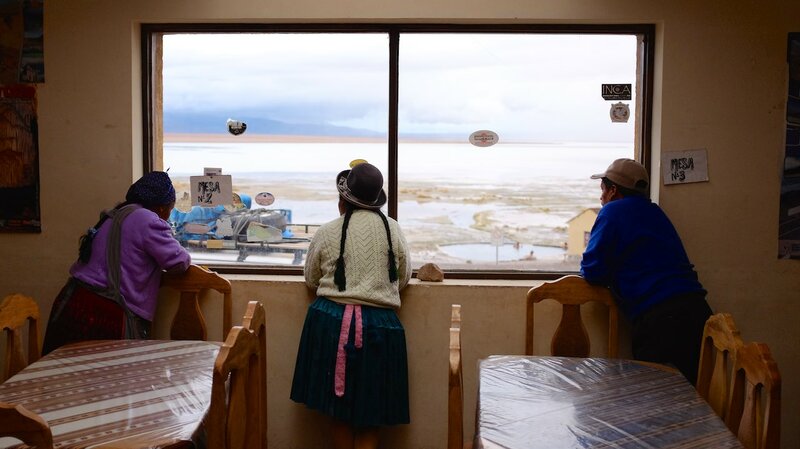 Bolivia is a large country and we had planned to take at least a couple of weeks of Spanish classes. We ask for extra days, but the man explains that he is not qualified to give more than 30 days. For an extension, we need to go to a customs office in the city. Too bad, nothing we can do about it. When we mention we are traveling on motorbikes, they look worried. 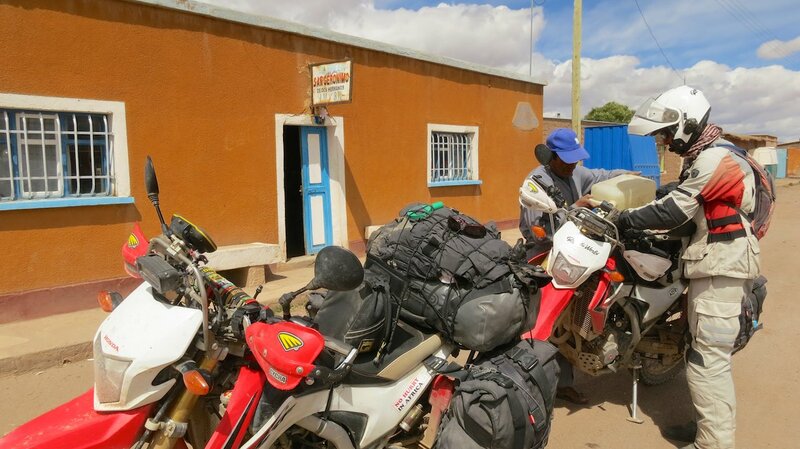 The customs office where we have to import the motorbikes is 80 km away. We will not make it there today. We had planned to go there tomorrow, but the men don’t seem to think that is a good idea, because then we would have two different dates in our passports. At this office they can fill out the paperwork for the bikes, but they do not have computers. In fact, they do not even have electricity or running water. Without a computer, the paperwork will only be processed in two weeks. If we promise not to leave the country within two weeks, he will register the bikes here. We can promise that. 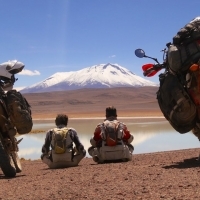 He fills out the documents and asks how long we want to stay with the motorbikes in Bolivia. “90 days please.” That’s too long, but he can give us 60 days for the bikes. While he is finishing up the paperwork, we mention that his colleague could only give us 30 days. The man looks at us, thinks for a second and then says that he knows a solution for that. We follow him to the first counter, where he takes out the stamp pad. He then puts a second stamp into each passport. “So,” he says, “30 plus 30. Now you can stay in Bolivia 60 days” A great Bolivian solution! Really nice, because this saves us the trouble of getting an extension! 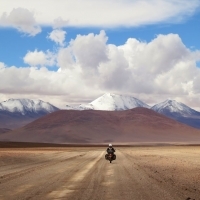 Back at the bikes, the soldier raises the barrier and we drive into Bolivia, the 23rd country on our trip! As we leave the buildings behind us, we look out over a vast plain with snowy peaks around it. It is very beautiful! After the steep climb to get up here, it feels like we are on the roof of the world. 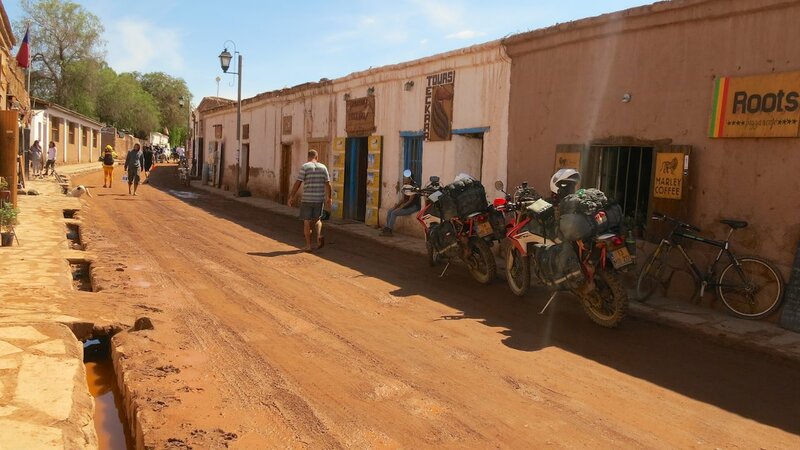 We ride down the gravel road to the entrance of National Park Fauna Andina Eduardo Avarua. The Lagunas Route leads along several lakes of which the most beautiful ones are located in this park. We follow a winding path to a higher plateau where we look out over the first two lakes; Laguna Verde and Laguna Blanca. The color of the water gave the Lagunas their name. 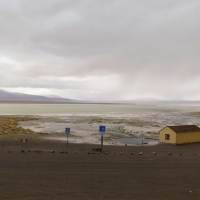 Especially Laguna Verde is very special, because the water changes color by the sun and the wind. 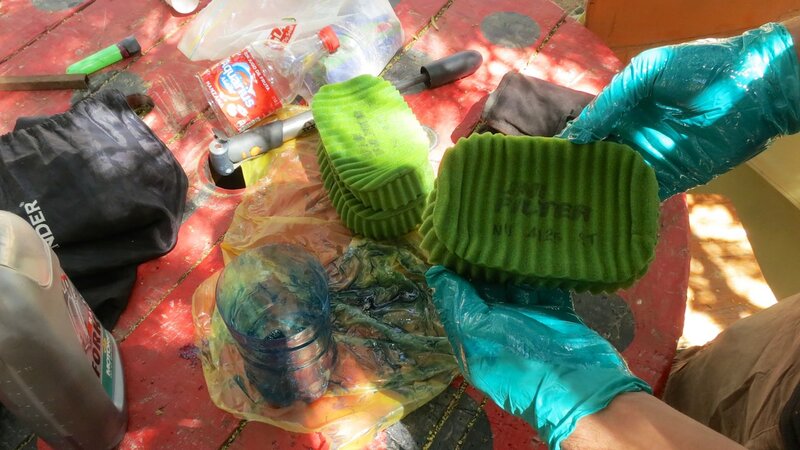 The water is now mint green, but it can be deep green or even bright blue. The sun is nowhere to be seen. In the distance we do see a little bit of blue sky, but behind us the thick gray clouds come rolling in. Pretty soon they’ll take us over. We start riding north following the gravel road and ride into a valley where we find ourselves surrounded by volcanoes. Each peaks is over 5,000 meters high. The floor of the valley is covered with huge rocks, that were spit out by the volcanoes during one of the eruptions. The volcanoes on our left form the border between Chile and Bolivia. 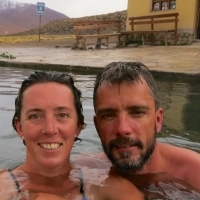 Not so long ago we saw those from the other side, when we visited the Geysers del Tatio with Ton and Marijke. We ride up one of the lower hills and look out over the next valley from the top of the hill. It is very different from the last valley. No gray gravel, but rust-coloured sand. In the distance it rains. And even where we stand now, it rained not so long ago. And that is a good thing, because the sandy path is quite hard, making it a lot easier to cross. In the distance we can already see the next lake: Laguna Chalviri. This lake is slightly different from the first two, and special because there is a hot spring in the lake. At the edge of the lake there is a small basin where the hot water is collected. If our information is correct, we can camp here tonight and enjoy the warm water. We ask the care taker if we can camp here. He nods and asks where we want to park our car. When we mention that we are on two motorbike and sleep in a tent, he shakes his head. No, it is too cold for camping. He can’t allow it. Instead, he offers us a place to sleep in the corner of the restaurant. He starts to pile up chairs, moves a table and shows us that there is room for two sleeping mats on the floor. The only condition is that we have to leave the restaurant the next morning at 07:00 AM, because the 4x4s with tourists will then arrive to visit the hot springs. That’s not a problem at all. We are very happy to be sleeping inside, because it looks like it will rain. 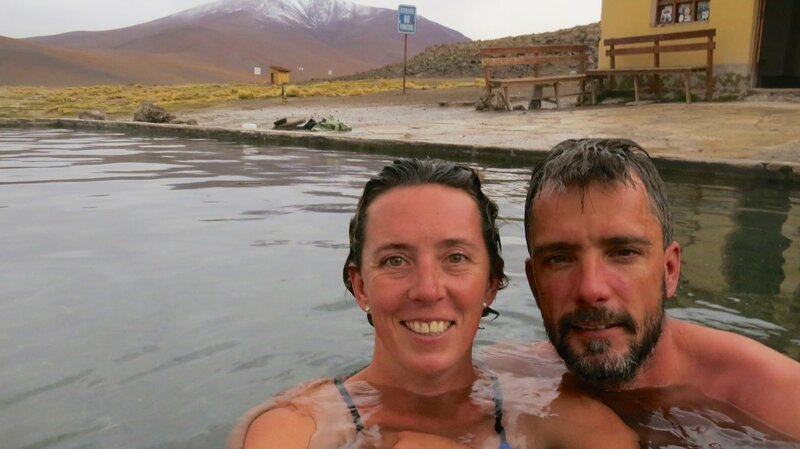 It costs 10 Bolivianos per person, including admission to the hot spring. A quick calculation tells us that he is asking € 26,- That’s a a lot for a spot on the ground, even for Bolivian standards. If we check the exchange rate again, it turns out he is actually asking € 2,60! We take our stuff inside, pump the mats and get out our swimsuits. It’s time to go for a bath! The water is 37 degrees and really warm. It comes bubbling up from the bottom of the basin on one side and flows out of the basin into the lake at the other side. The ducks in the lake seem to appreciate the hot water as well. Even when it gently starts to rain, it’s warm enough. We share the small pool with two local visitors. A lady is washing her hair and a man uses the warm water to wash his clothes. Only when our fingers and toes are wrinkled, we leave the pool and go inside to eat. We can use the kitchen of the restaurant to boil some water for our dinner. There are two women in the storage room next to the kitchen peeling a huge bucket of potatoes. They look beautiful and wear colorful clothes, a bowler hat and two long braids. They are having a chat and seem to have a great time, laughing really hard. Even though I picked up some Spanish the last months, I do not understand a word they are saying. 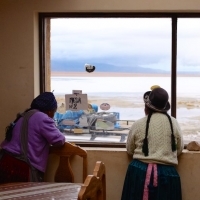 They speak Quechua, one of the 37 official languages ​​in Bolivia and the language that was spoken by the Incas. To me it sounds like a combination of Russian and Hebrew. It is not just the clothing and the language that has changed. The people look different, the music sounds different and the food smells different. It looks in no way like Argentina and Chile and is so different that it seems like we’ve stepped into another world. It feels like we are back on an adventure! We prepare some soup and from behind the window we see how the sun is setting. It soon is pitch dark, because there is no electricity. There is no running water either. The toilet is actually a hole in the ground with a toilet pot above it. It does not smell particularly fresh, but it does look clean. Now that it is dark, our host is getting ready to go to bed. It’s still early, at most 07:00 PM, but we are both tired and we have a headache as a result of the altitude. We are still at 4,440 meters. We decide to follow the example of our host and crawl into our sleeping bags in the corner of the restaurant. While we try to get some sleep, we hear a storm raging outside. The dark clouds that were following us are now right above us. We are very glad that we are not in our tent! The next morning we feel a lot better. It was a very short night, because the ladies already starting peeling more potatoes at 05:30 AM this morning. We pack our stuff and boil some water for our breakfast. The sun rises turning the sky orange. It’s chilly outside, which you can even see by the steam that is coming from the hot spring. When we are still having breakfast, the first 4x4s with tourists arrive. Soon there are more than ten 4x4s parked in front of the restaurant and there are at least 50 tourists in the small pool. It’s time to go! We say goodbye to our hosts, grab our stuff and get on the bikes. That morning, we ride a scenic route. At first along the lake and then up into the hills until we suddenly stand in the snow! The dark clouds we saw yesterday left a layer of snow on the highest peaks overnight. It is beautiful, a true winter wonderland. 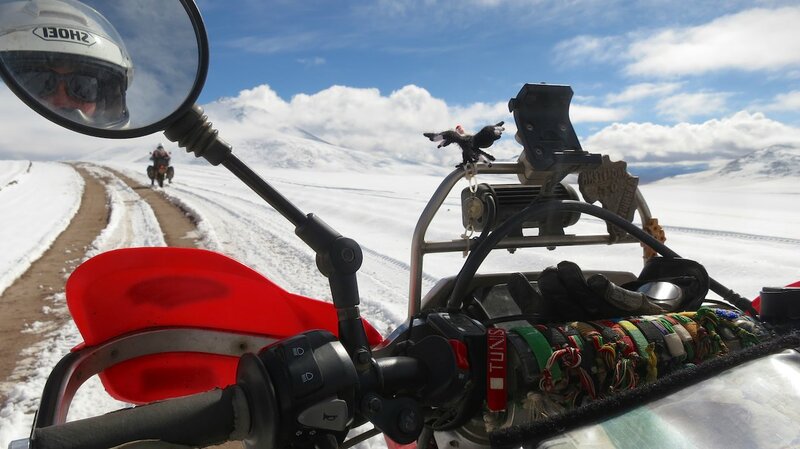 Even more than yesterday, we feel that we are riding on top of the roof of the world. 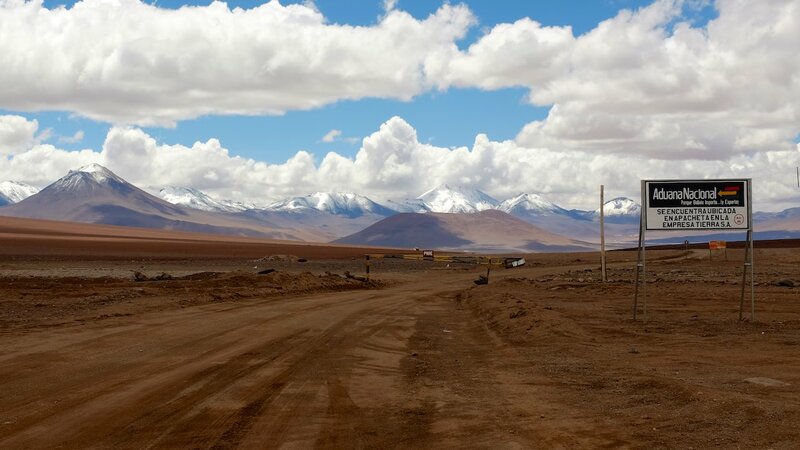 And that’s not such a crazy idea, because we only reach the highest point of the pass at 4,898 meters. The highest point of the trip so far. On the other side of the pass, the world is suddenly very different. A vast golden plain where the sun has already melted all the snow. In the distance we can see the next lake: Laguna Colorada. There are several tracks criss-cross towards the lake. We drive into the valley, cross the plain and eventually stop on a hill where we have a view of the lake. 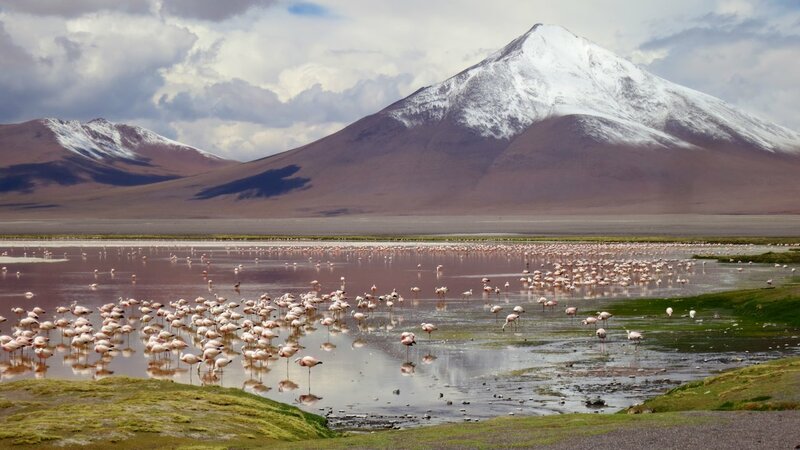 The view is incredible: the snowy mountain peaks against the blue sky and the red water with hundreds of flamingos at the edge of the lake. It takes our breath away: “Look where we rode our bikes!” We stop for an early lunch and watch with the binoculars how the flamingos walk through the water. If we look behind us a little while later, we see that the sky has turned almost black. Time to go, because we do not want to get caught in a thunderstorm here. We put on our rain gear and ride along the lake to the north. Until now it was very clear where we had to go, because there was only one gravel road. But that has changed. On the plain there are at least a dozens tracks criss-crossing each other. Many tracks are rutted or so hard that they have turned into washboard. The latter is no fun to ride. Instead, we get onto the sand next to the tracks. And luckily the sand is nothing like the soft sand in the Sahara, but nice and compact. We can actually ride across the sandy plain quite easily. In fact, it is super fun to ride here! With a big smile on our faces we race side by side across the plain. Great! However fast we ride, at the end of the day we are still overtaken by the bad weather. It starts to rain and then even snows and hails. Fortunately it does not last long and, as a bonus, it gives us a beautiful picture, because all of a sudden all the tracks are visible as the snow stays in the tracks. It’s time to stop and look for a camping spot. It is still early, but we are tired. We also suffer from the altitude, as a result of which riding takes a lot more effort than usual. According to the GPS there is a valley on the other side of the hill where we can camp next to some rocks, out of the wind. We find the valley and find a place to pitch our tent. It’s a nice spot next to some huge boulders. By the time we have pitched the tent, we first lie down in the tent for a while. We are both completely exhausted. It is only four o’clock in the afternoon, but the effect of the altitude is extraordinary. We only come outside to eat but soon after dinner we get into our sleeping bags again. We are tired and it is also very cold. Even in the tent. Only with some extra clothes we get warm enough to fall into a deep sleep. The next morning we stay in bed as long as possible. There is ice on the tent, which doesn’t make it very interesting to leave our warm sleeping bags. When we finally venture outside, it appears to be very nice weather. The sky is blue and the sun is already quite high. 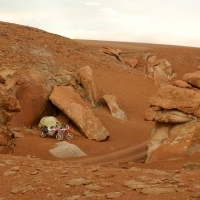 We hadn’t noticed because our tent and the bikes are still in the shadow of the big rocks. It has been cold. The bikes are white with dew and Peters swimsuit, that was hanging on his motorcycle to dry, is frozen stiff. We put the bikes in the sun and warm ourselves with a big cup of coffee. Once everything is packed, we continue our way through the valley to the north. 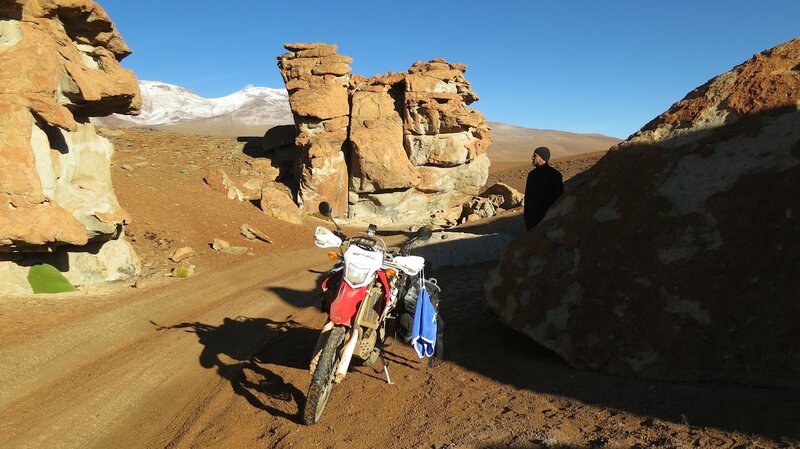 We ride past rock formations on which a very special plant grows and we even see a Southern viscacha; a kind of rabbit with huge whiskers and a tail like a squirrel. It is wonderful animal that seems to come straight out of a storybook. When we leave the canyon, we ride onto a large plain. We open the throttle and -just like yesterday- we ride across the plains with a big smile on our faces. We find a nice track, next to the corrugated gravel road. And this is not just nice to ride, but also safer, because at some point we are overtaken by a large group 4x4s. They seem to think they taking part in the Dakar Rally, because they are almost flying past us. When the dust has settled, we see that they stop in the distance at Laguna Honda, the next lake in our route. We look at the group of cars from the hill and decide to wait. Chances are that they will soon leave again, to race to their next attraction. And indeed, after we have enjoyed the beautiful view for a while, we see everybody get back in the car again. They have taken their photos and the engines are started. The groups of cars follows a path along the lake and disappear moments later. We are all alone again. 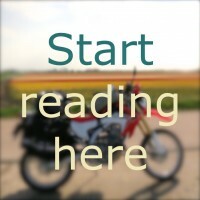 We slowly ride to the waterside and park our Honda motorbikes next to the Laguna Honda sign. And we sneak up to a flamingo for a closeup. Then we take the same route along the water and through the hills, towards Laguna Hediona. A great route. At Laguna Hediona we catch up to the group 4x4s. This time, it makes no sense to wait until they have left, because every guide has stopped to have lunch with his group of tourists. We find a bench overlooking the flamingos and get out our lunch as well. After lunch we decide to take another route. The 4×4’s drive north from here, but we turn east. There is still one more lake that is worth visiting: Laguna Chulluncani. Once we leave the beaten path and start heading east, the road suddenly becomes quite bad. We ride up a path with large boulders. It’s a lot harder than the route we took the last few days, but still a lot a fun and very beautiful. The trail winds through the mountains and an abandoned mining village. Just after the village we have to cross a river. It seems to be quite deep, with thick mud on the bottom. Peter tries an alternative route over some grass. However, the ground is so swampy that his rear wheel directly sinks down in the mud. It is completely stuck. Together we manage to push his motorcycle over the grass to the other side of the small river. We decide to ride my motorcycle right through the water and that appears to be really easy. We definitely chose the hard way the first time, but it was a fun adventure. We drive all afternoon without seeing anyone else. First along Laguna Chulluncani, where we see the flamingos and geese. Then through the mountains and onto a high plateau. The landscape is constantly changing and is beautiful. Halfway through the afternoon we are back on the main road. 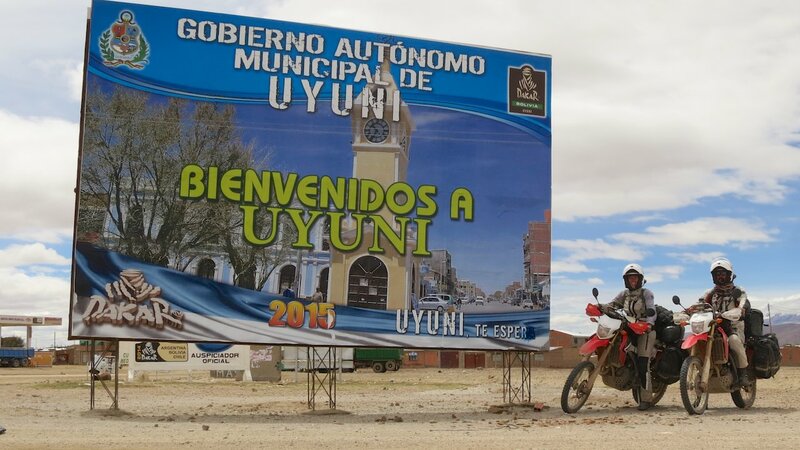 It is only 150 km to Uyuni, which is only a few hours away on the gravel road. But we do not want to go to the city yet and prefer to stay another night camping. 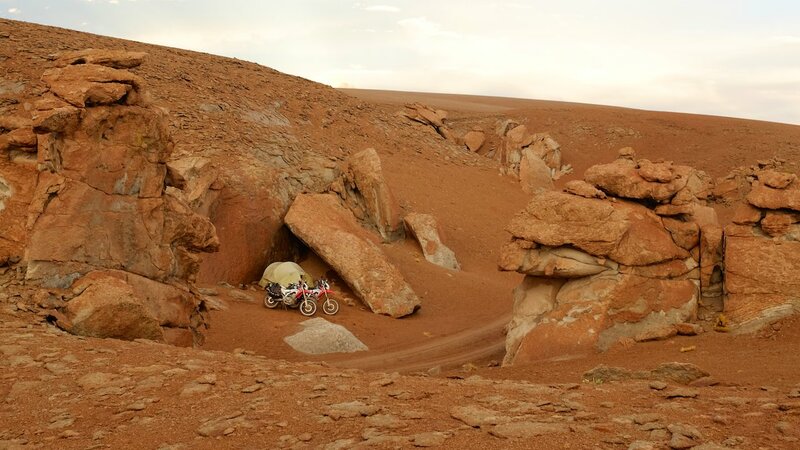 We find a camping spot away from the road, between some huge boulders. We pitch our tent and climb on one of the boulders to watch the sun set. What a super nice spot. 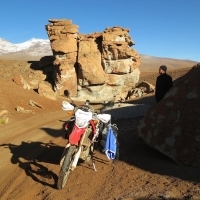 The next morning we ride back to the main road and continue towards Uyuni. In the first village we ride through, Villa Alota, we look for a gas station. 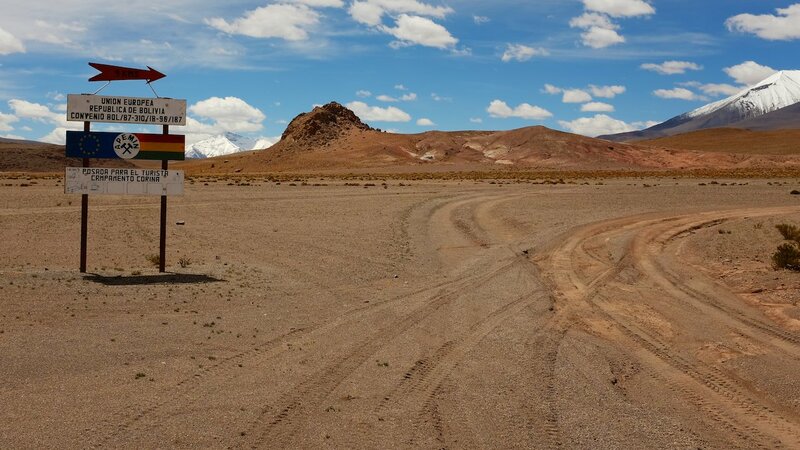 We still have some gasoline, but we want to avoid getting stranded just before Uyuni. The small village has no gas station, but we find a mechanic who can sell us fuel. From a large jerrycan we fill both tanks. This should be enough to ride to Uyuni. We follow the gravel road further north and see the city gloom in the distance. We have nearly completed the Lagunas Route. After all the horror stories we had heard, it went 200% better than expected. The roads and trails were in great condition and very good to ride. There have been some difficult parts, but we mostly had a lot of fun. The weather also was in our favour. We had enough water, food and fuel, but could have bought some along the way if we had needed it. The altitude was bothering us a bit, but with enough rest we did not have any real problems. We are very happy that we decided to ride the route despite the stories and are happy we did not miss it. It was amazingly beautiful and without a doubt a highlight of our trip in South America! CLICK HERE TO VIEW ALL PICTURES. PS: For anyone who would like to ride the Lagunas route we have put together some information on our website (click HERE to read it). 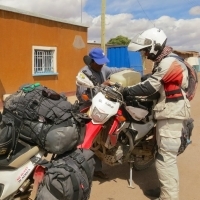 And there is more new information on the website: our route is updated, we have added information about the motorbikes and we have made a list of “Frequently Asked Questions”. Click on one of the links to read more. Ook ik heb weer genoten van jullie verhaal, maar ook van alle eerdere verhalen, en natuurlijk van de prachtige foto’s. Dank je wel dat jullie ons mee laten genieten. We wensen jullie een fijne kerst en veel geluk voor het nieuwe jaar, mooie ontmoetingen en belevenissen, en een veilige reis. ik sluit me aan bij het bericht van Anna,heb het al meer gezegd waarschijnlijk,maar wat een prachtige foto’s weer. Jullie zitten nu alweer helemaal aan de andere kant van de wereld terwijl het verslag nog in Zuid Amerika is. Ik ben benieuwd naar de volgende belevenissen. 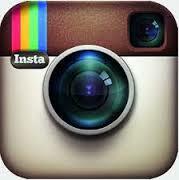 Just looking at the pictures makes us jealous. Enjoy the last long journey home. En wat een mooie route was dat zeg, zo veel prachtigs!